Let us remember your secrets so you don’t have to! XTAM automatically provisions a Personal Vault for each user who logins into XTAM. These Personal Vaults provide a secure area where users can store their own secrets, connections, logins, keys or any other records they wish. These areas give each user full ownership of their own vault and its content, while no other non-Administrative users are granted access. However, any folders and records created in a Personal Vault can be shared with others users if the Vault owner chooses, creating a shared secret area. Creates better organization as users do not have to store their personal secrets in XTAM’s default Records List (i.e. root folder). Provides a secure area where a user may store and have full control over their own assets like logins, keys and connections. Works with the XTAM Browser Extension to provide an automated login experience to websites. 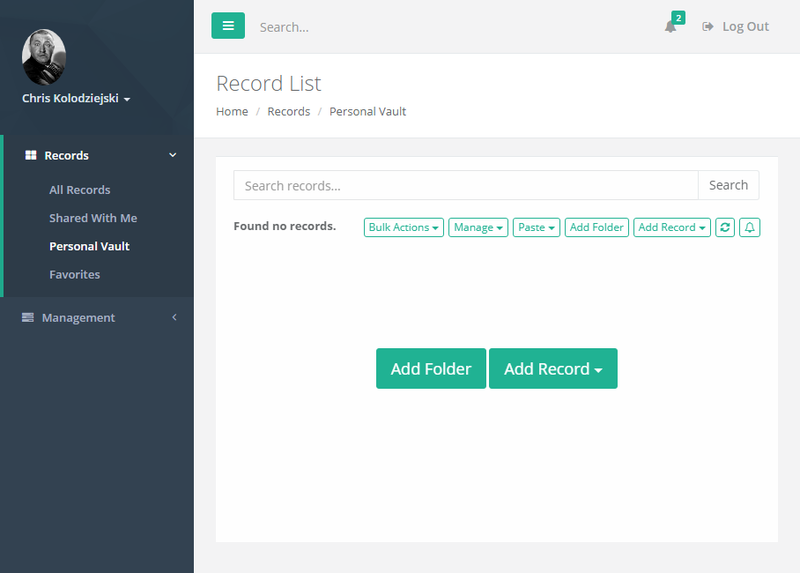 Allows a user to share records from their vault with others, creating a shared secret space. System Administrators, Auditors and users with Global Permissions still maintain some access to Personal Vaults to ensure corporate compliance and regulations. Select the Disabled option for the dropdown menu and then click the Save button.